Bitcoin is probably the first example of a fast growing category of money known as cryptocurrency. The idea was invented by an unidentified programmer, or group of software developers under the name of Satoshi Nakaamoto. Since then, a ton of folks are earning a living from it. In a nutshell, Bitcoin is a payment system or a form of digital currency, created and held electronically. No one controls it and they’re are not printed like dollars, euros or pounds. Bitcoins are produced by people’s using softwares that solves mathematical problems. The currencies are independent of any central authority and it can be transferred electronically with more or less instantly at a very low transaction fees. Also Read: 7 Best Paying Websites To Shorten URL And Earn Money Online. Coinbase is regarded as the world’s most popular bitcoin wallet app for all Android device. The app makes it easy to securely manage, buy, use and also accept bitcoin currency. One cool thing i have come to fancy or perhaps like in Coinbase Bitcoin Wallet app is that the app brings a sleek and simple user interface and moreover it has been designed from the scratch to provide you with the best and possible bitcoin experience on mobile. Coinbase can be trustworthy and thus you can use it to buy, sell and securely store bitcoin in your Vault for zero fees. The app also allows you to check your Bitcoin balance, transaction history & transaction details for all your accounts in a glance. You can set a passcode and remotely disable your phone access if stolen or lost. Overall, Coinbase is a convenient Bitcoin wallet app and can be used to generate a bitcoin address to receive bitcoin and also send bitcoin via email and QR code with zero transaction fees. Currently over 1 million people downloaded Coinbase Bitcoin wallet app from the Google Play Store. The perfect way to have all your Bitcoins always with you, or in your pocket is by installing the official Bitcoin wallet app which is available for free on Android. If perhaps you’re a merchant, then you will receive payments reliably and instantly using the Bitcoin wallet app. The Bitcoin wallet app is arguably the first, the best, the secure and the most popular app for storing all your Bitcoins. Bitcoin wallet app brings an easy-to-use interface and the app doesn’t require any registration, web service or cloud since the wallet has been de-centralized and peer to peer. Bitcoin Wallet app accurately displays off all your Bitcoins amount in BTC, mBTC and µBTC. The app allows you to pay via Bluetooth even when you’re offline and that’s one of the cool features integrated into it. With Bitcoin Wallet app, sending and receiving of Bitcoins via NFC, QR-codes or Bitcoin URLs is been made easy. The app also features an address book for regularly used Bitcoin addresses. You can use the app widget to check your Bitcoin balance and also convert Bitcoins to and from national currency. Overall Bitcoin wallet app seems pretty cool as it notify you of received Bitcoins and sweeping of paper wallets just like those used in cold storage. Xapo Bitcoin wallet and Vault can be one of the most convenient way to secure all your Bitcoins. It’s a free mobile bitcoin wallet and vault app for Android which adequately combines convenience and industry-leading security for managing your bitcoins and sending money to your friends or family. Using the Xapo Bitcoin wallet app, you can easily scan a QR code or enter an email address, name, wallet or vault address to instantly send money to your recipient anywhere in the world. Xapo ensures that all your transactions are synced across all of your devices in a real time and they’re been protected by an intense and bank-level security protocol. Xapo Bitcoin Wallet Android app just like Coinbase also brings a ton of plethora features and the app functions just like a checking account for managing daily spending. It’s the only fully insured Bitcoin storage solution on the market and you can use it to send and receive bitcoins in two clicks directly from your mobile. Xapo Bitcoin Wallet app brings a two factor authentication, and you can check the price of bitcoin and other stats in real time via the app. 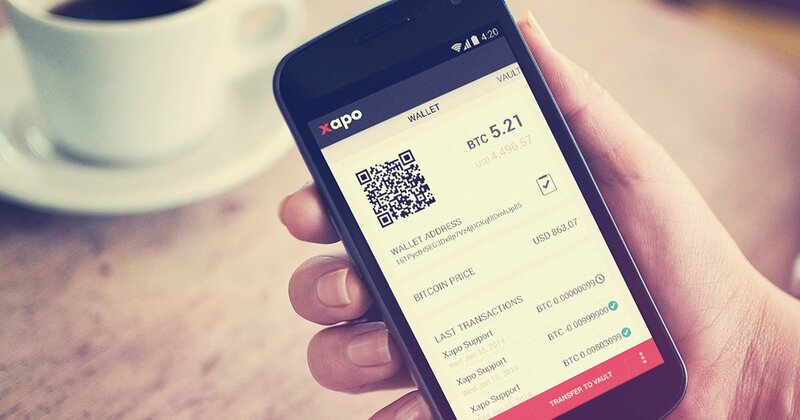 Overall, Xapo Bitcoin Wallet app makes it convenient to buy bitcoins and the app features a zero network transaction fees. Currently over 100 thousand people downloaded Xapo Bitcoin Wallet and Vault from the Google Play Store. Luno Bitcoin Wallet app formerly known as “Bitx” is yet one of the most popular Bitcoin Wallet app for Android phones. Luno Bitcoin Wallet conveniently makes it safe and easy to buy, store, use and learn about Bitcoin. I’d recommend this app for beginners who wants to venture into mining bitcoins as it brings an easy-to-use and intuitive design interface. Luno Bitcoin Wallet apps allows you to buy Bitcoins in three easy steps which is to sign up and complete the verification process. From there, you can transfer money to your Luno bitcoin account via bank transfer or credit card then convert your local currency to Bitcoin with Luno Instant Buy. Luno Bitcoin Wallet app has been design to fit those who’re new to Bitcoin and also advanced users. It’s probably a must have app for those looking for a smart, safe and beautiful way to buy, sell, store and spend their Bitcoin. With Luno, you can buy Bitcoins anywhere in the world directly with your credit card. You can also send and receive Bitcoin via QR codes, email or your wallet address using the Luno Bitcoin Wallet app. Luno also features the ability to purchase airtime and you can monitor the price changes of Bitcoin directly from the app. Overall, Luno Bitcoin Wallet app is the perfect way to store your Bitcoins securely using the app’s advanced multisig and cold storage. Blockchain is one of the most popular Bitcoin Wallet for Android device that’s convenient and secure. You can use the app to safely and securely access all your Blockchain wallet or you can choose to create a new wallet. This can all be done directly from the app since it’s free and just takes just a few seconds. Blockchain just like Xapo Bitcoin Wallet app unravel a ton of smart features that’s of essence and this makes the app extremely secure and trustworthy. Using Blockchain, you can send and receive Bitcoins instantly with anyone in the world. The app is fun, safe, simple, ease of use and brings a rest assured mind. Blockchain allows you to stay in control and you’re the only one who has access to your bitcoins. Blockchain also brings a successfully completed high security audits by world-class researchers and they provide PIN protection for your Bitcoin account. Also similar to the official Bitcoin Wallet app, Blockchain displays off all your Bitcoin amounts in BTC, mBTC, or bits. You can browse Bitcoin merchants in your area directly from the app and moreover it supports QR code. Blockchain Bitcoin wallet app also features an hierarchical deterministic address architecture and a server-side entropy for maximum randomness. Overall the Blockchain Bitcoin Wallet app is totally convenient since it brings a client side encryption and decryption. Now you can securely manage all your Bitcoins and transactions from your Android device with ease. The above listed Bitcoin Wallet apps are the best from our catalogue and moreover they’re convenient and easy-to-use. It’s time to join the Bitcoin merchants and there’s no other way to start without a Bitcoin Wallet app. If perhaps we’ve skipped or failed to mention any popular Bitcoin Wallet app for Android device, then you can notify us by using the comment box below!.